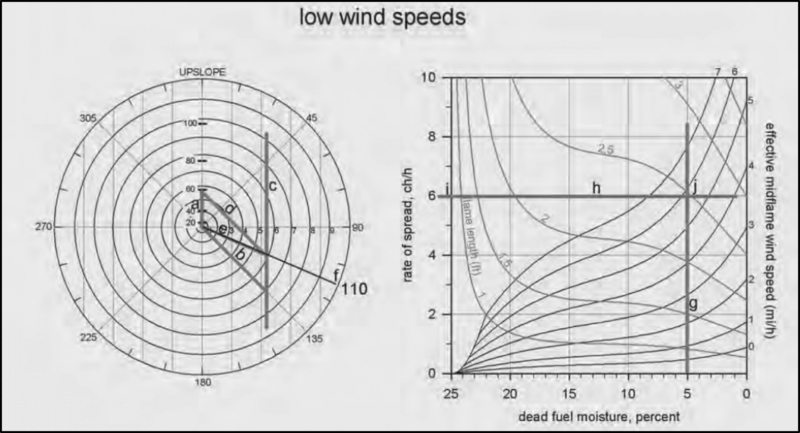 Select the Appropriate Windspeed (Low/High) Nomogram. Each fuel model includes a duplicate set of effective windspeed protractor and fire behavior nomograph, one for low windspeeds and one for high windspeeds. Select the one with applicable windspeeds. Midflame Windspeed and direction, azimuth clockwise from upslope. Dead and Live Fuel Moistures. Use the left side nomograph, shown above, if the situation includes cross slope winds. Plot the slope vector (a) in the upslope direction to the hash representing the slope percent. Interpolate if necessary. Plot the wind vector (b) using the concentric circle to for the input windspeed and the azimuth above for direction. Plot parallel vectors (c and d) and resultant vector (e). Read resulting windspeed (e) and direction (f). If the fuel model includes a live fuel component, use the nomograph that references the appropriate live fuel moisture. Otherwise, there is only one nomograph, shown on right. Using the input dead fuel moisture, draw vertical line (g) to the estimated EWS curve. Read the flame length from the embedded curves at the intersection (j). Interpolate between lines if necessary. Draw horizontal line (h) to the left axis and read the Rate of Spread at intersection (i). Reference: Rothermel, Richard C. How to predict the spread and intensity of forest and range fires. Gen. Tech. Rep. INT-143. Ogden, UT: U.S. Department of Agriculture, Forest Service, Intermountain Forest, and Range Experiment Station; 1983. 1 61 p.
These nomograms are only available for the original 13 fuel models. They are intended for use with wind blowing within ±30 degrees of upslope. Use in vectoring is possible, though it is not outlined here. Dead fuel moisture (use 1-hr). Live fuel moisture for fuel models 2, 4, 5, 7, & 10. The numbered steps below correspond to the labeled lines on the example nomograms. 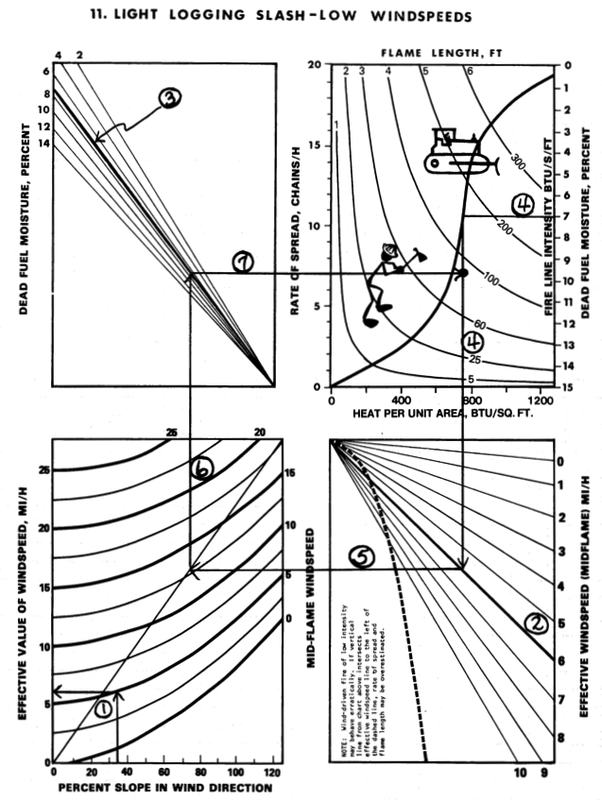 In the lower left quadrant, draw a vertical line from percent slope value to intersect midflame windspeed curve. Draw a horizontal line to the left axis and read effective windspeed. In the lower right quadrant, identify and highlight the appropriate effective windspeed line. Interpolate by adding a line for effective windspeed from step1 above if it is between existing lines. For FM 1, 3, 6, 8, 9, 11, 12, 13 with only dead fuel. 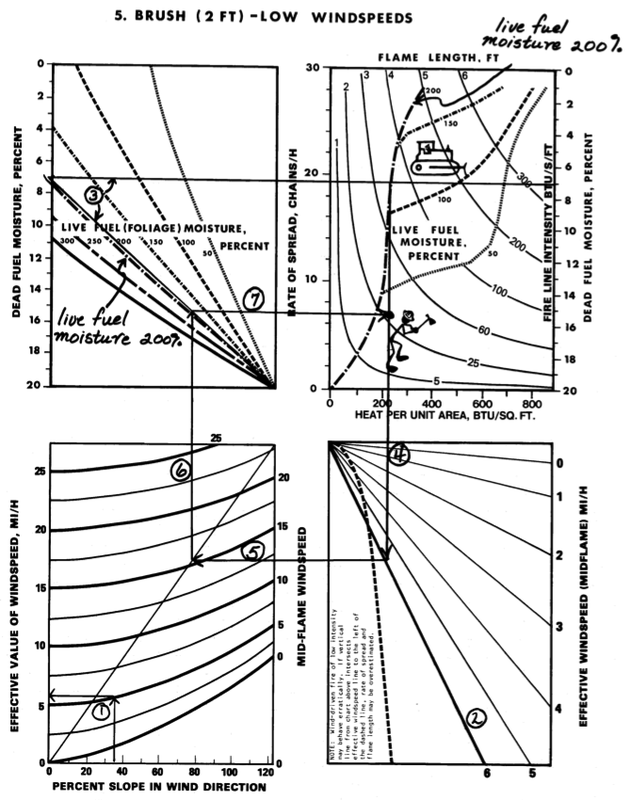 In the upper left quadrant of the nomogram, identify and highlight the appropriate dead fuel moisture line based on the input value provided. Interpolate by drawing a new line between existing lines if necessary. For FM 2, 4, 5, 7, 10 with live fuel. Using the two upper quadrants, locate the appropriate dead fuel moisture value on the two outer vertical axes (highlighted). Connect with a horizontal line. Connect the point where the horizontal line intersects the live fuel curve in the upper left quadrant to the origin point, creating a straight line. Using the input live fuel moisture provided, identify and highlight the appropriate S-curve in the upper right quadrant. Interpolate by adding a new line between existing lines if necessary. At this point, turning lines have been identified in all 4 quadrants (including the S-curve in the upper right quadrant and the default corner to corner line in the lower left). The nomogram is prepared for Part III. With the preparations in parts I and II, turning lines have been highlighted in the lower right quadrant and the upper left quadrant, as well as the appropriate S-curve in the upper right quadrant for fuel models with live fuels. Begin in the upper right quadrant. Draw a horizontal line from dead fuel moisture to the highlighted fuel moisture turning line (s-curve). From the intersection, draw a vertical line down to the turning line in the lower right quadrant (highlighted in step 2). From the intersection with the turning line in the lower right, draw a horizontal line to the turning line in the lower left quadrant. From the intersection with the turning line in the lower left quadrant, draw a vertical line up to the turning line in the upper left quadrant (highlighted in step 3). From the intersection with the turning line in the upper left quadrant, draw a horizontal line to the right until it intersects the vertical line drawn in step 4. Read Heat Per Unit Area where the vertical line from step 2 intersects its axis in the upper right quadrant. In the first example (Dead Fuel Only), the Heat Per Unit Area is estimated at approximately 750 BTU/sq. ft. In the second example (Dead & Live Fuels), the Heat Per Unit Area is estimated at approximately 215 BTU/sq. ft.
Read Rate of Spread where the horizontal line from step 5 intersects its axis in the upper right quadrant. In the first example (Dead Fuel Only), the Rate of Spread is estimated at approximately 7 chains per hour. In the second example (Dead & Live Fuels), the Rate of Spread is also estimated at approximately 7 chains per hour. Read Flame Length and Fireline Intensity at the final intersection produced in step 5. In the first example (Dead Fuel Only), the intersection between lines 4 and 7 comes between the Flame Length/Fireline Intensity contour lines 3/60 and 4/100. It could be estimated as 4 ft or 90 BTU/ft/sec. In the second example (Dead & Live Fuels), the intersection between lines 4 and 7 comes between the Flame Length/Fireline Intensity contour lines 2/25 and 3/60. It could be estimated as 2 ft or 30 BTU/ft/sec.